Pretty Vulgar Bury Them With A Smile Matte Lipstick in Baby Doll Against BS. 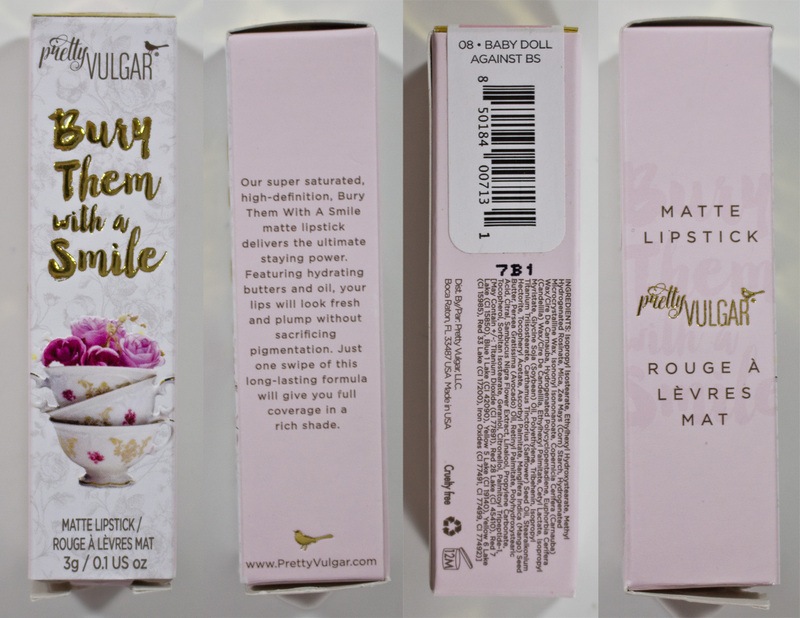 The Pretty Vulgar Bury Them With A Smile Matte Lipstick retail for $24US or $29CAN for 0.1 oz / 3 g of product. 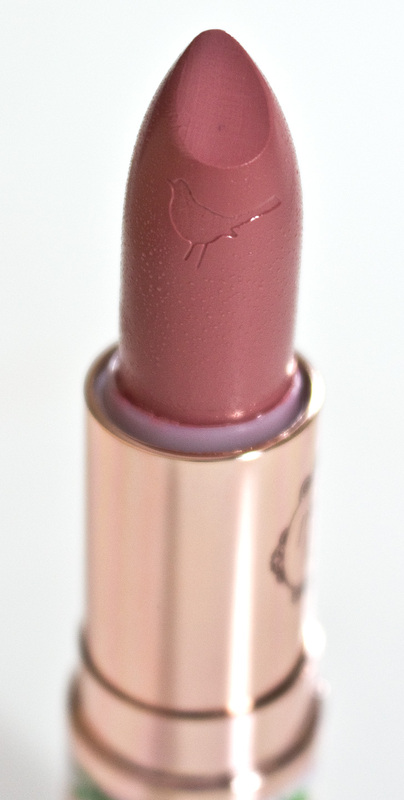 Pretty Vulgar Bury Them With A Smile Matte Lipstick in Baby Doll Against BS, Bird imprint. 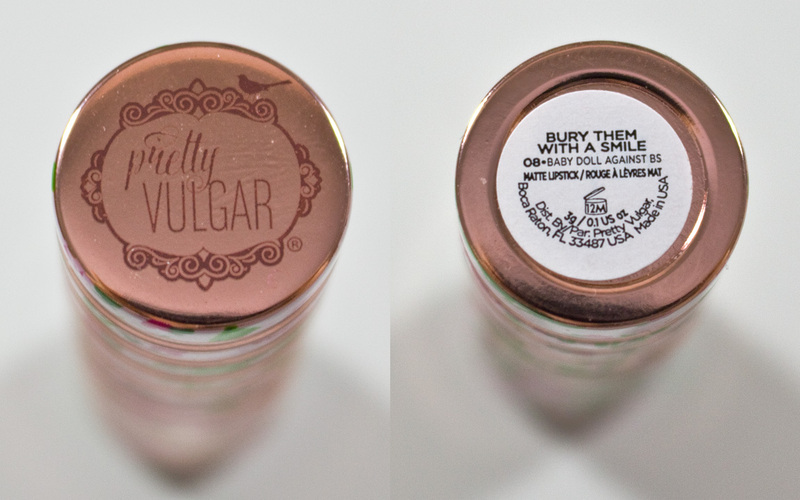 Pretty Vulgar Bury Them With A Smile Matte Lipstick in Baby Doll Against BS, tube cap and bottom label. Pretty Vulgar Bury Them With A Smile Matte Lipstick in Baby Doll Against BS box art. 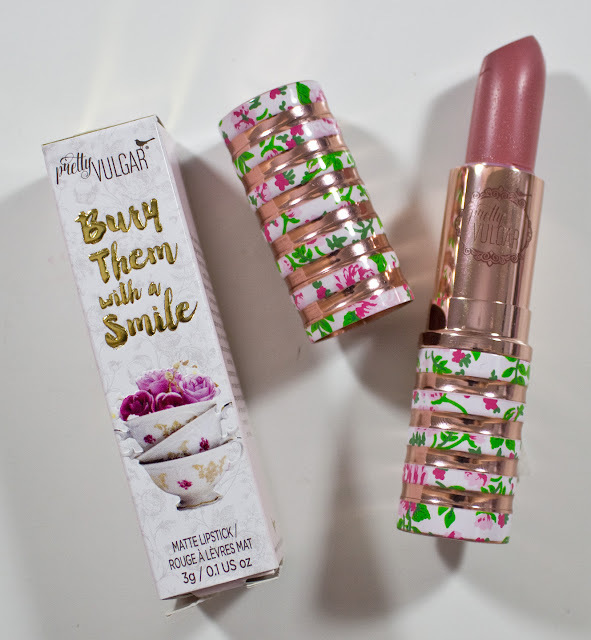 Pretty Vulgar Bury Them With A Smile Matte Lipstick in Baby Doll Against BS box top and bottom. Isopropyl Isostearate, Ethylhexyl Hydroxystearate, Methyl Hydrogenated Rosinate, Mica, Zea Mays (Corn) Starch, Hydrogenated Microcrystalline Wax, Isononyl Isononanoate, Copernicia Cerifera (Carnauba) Wax/Cire De Carnauba, Hydrogenated Polycyclopentadiene, Euphorbia Cerifera (Candelilla) Wax/Cire De Candelilla, Ethylhexyl Palmitate, Cetyl Lactate, Isopropyl Myristate, Glycine Soja (Soybean) Oil, Polyethylene, Tribehenin, Isopropyl Titanium Triisostearate, Carthamus Tinctorius (Safflower) Seed Oil, Stearalkonium Hectorite, Tocopheryl Acetate, Ascorbyl Palmitate, Mangifera Indica (Mango) Seed Butter, Persea Gratissima (Avocado) Oil, Retinyl Palmitate, Polyhydroxystearic Acid, Citral, Sambucus Nigra Flower Extract, Linalool, Propylene Carbonate, Tocopherol, Sorbitan Isostearate, Geraniol, Citronellol, Palmitoyl Tripeptide-1, [May Contain +/-: Titanium Dioxide (CI 77891), Red 28 Lake (CI 45410), Red 7 Lake (CI 15850), Blue 1 Lake (CI 42090), Yellow 5 Lake (CI 19140), Yellow 6 Lake (CI 15985), Red 33 Lake (CI 17200), Iron Oxides (CI 77491, CI 77499, CI 77492)]. This Baby Doll Against BS is a light rose pink with a cream finish. The formula is supposed to be a matte finish but is more of a cream finish with a slightly wet look to the lips without it being glossy. It's both comfortable to wear and easy to apply to the lips. Wear: Close to 5-6 hours of wear before slight fading occurs. Rose gold tube with a floral pattern on white stripes. It's lighter weight because of its plastic material over metal as well. But it a well thought out design in terms of closing and opening it. Besame Portrait Pink 1963 & Pretty Vulgar Bury Them With A Smile Matte Lipstick in Baby Doll Against BS. 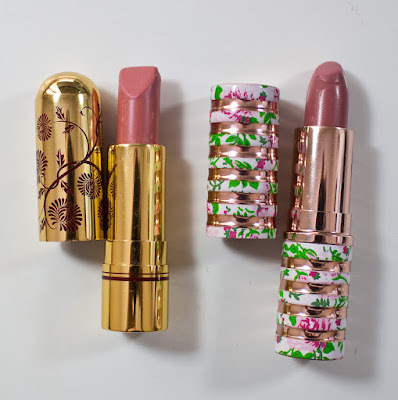 Formula wise the Besame lipstick is more matte and longer wearing compared to Pretty Vulgar Bury Them With A Smile Matte Lipstick. The Besame shade Portrait Pink 1963 out of my collection of lipstick shades was the closest one I own, but it leans lighter and more coral in comparison. Daylight and Flash swatches: Besame Portrait Pink 1963 & Pretty Vulgar Bury Them With A Smile Matte Lipstick in Baby Doll Against BS. It a nice lipstick overall and the markup price in Canadian dollar it decent compared to other brands. It just a matter of a finding shades that work for you as you are paying for the packaging cuteness as well. 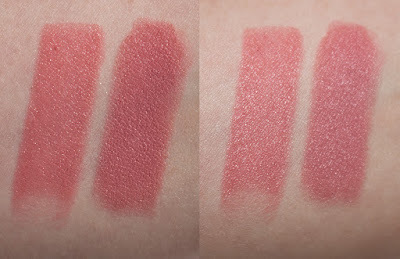 I'd rather recommend Besame formula if you what that higher end quality like NARS Audacious lipsticks. 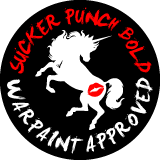 ;) But I happy I don't own a similar shade of pink and the rest of the shade line look very dupe-able.